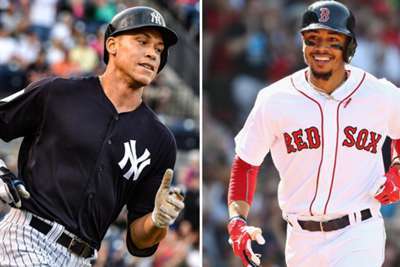 In 2018, the American League East provided Word Series champions the Boston Red Sox, a second 100-win team in the New York Yankees, AL MVP Mookie Betts and AL CY Young winner Blake Snell of the Tampa Bay Rays. The calendar may have flipped, but it is likely to be more of the same as storylines will not be hard to find from this division in 2019. Boston have a target on their back, the Yankees have taken aim with free-agent signings and a largely healthy core, the Toronto Blue Jays appear ready to turn the organisation over to their star prospects, Tampa Bay want to prove they belong in the postseason and Baltimore, well, the Orioles will play 162 games. Boston have yet to make a decision on who will be their closer, and the two top candidates, Ryan Brasier and Matt Barnes, have a combined two saves in the big leagues. It is hard to believe, but it is possible we have not seen the best version of Aaron Judge as he enters his age-27 season. Judge was not even the best right fielder in his own division in 2018, but if he brings his spring form into 2019 he could be the first Yankees outfielder to win league MVP since Mickey Mantle in 1962. Chris Sale is the most criminally underpaid and underappreciated pitcher in baseball — but that will all change after this season. Sale is set to make $12.5million in 2019 before hitting free agency and will use the next six months to prove why he deserves a $20m raise in 2020. His ERA and WHIP have both dropped in each of the last four seasons, while his K/9 (strikeouts per nine innings) reached a career-high 13.5 in 2018. In a division ripe with star power, Vladimir Guerrero Jr may steal the most headlines of any player in the AL East this season. Baseball's top prospect will not start the season in the big leagues as he nurses an oblique strain, but when he slides into the middle of Toronto's order in May, he is expected to have an instant impact. The compact third baseman batted .402 with 14 home runs and 60 RBIs in 61 games at the Double-A level in 2018. His power and plate discipline (only 135 strikeouts in 276 minor league games) are fully expected to translate to the majors as he is arguably the most highly anticipated prospect since Bryce Harper in 2012. The Red Sox have won the division the last three seasons, and frankly, the Yankees seem to have had enough. New York addressed their infield depth, bullpen and starting rotation during the offseason after watching a 100-win season spoiled by Boston in the playoffs. The bullpen question looms too large for Boston to confidently put the Red Sox ahead of a Yankees team that check every box heading into the season. If the Yankees remains healthy and handle high expectations, they have no reason not to win the AL East.